Along the coastal road in the area of Vrontados at a distance of about 7 km from Chios city to the north is located Daskalopetra (Homer's Stone). As we enter the area we see the picturesque port and the beautiful beach with the cafeterias and many taverns along the shore. Up to a hill there is the famous "Homer's stone" from which the area took it's name. Daskalopetra means the teacher's (=daskalos) stone (=petra). Here, according to tradition, the famous and beloved blind poet and creator of the two epics, Iliad and Odyssey - Homer- used to teach his students, to the accompaniment of lyre's melody and the sea opened out magic, before their eyes. The view from up here is panoramic. 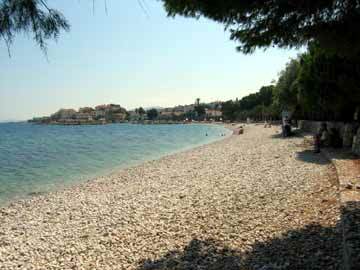 A crystal clear deep blue water pebble beach to enjoy swimming. After a bath you can taste some of the delicious local delicacies and fresh fish, in one of the traditional taverns around there.